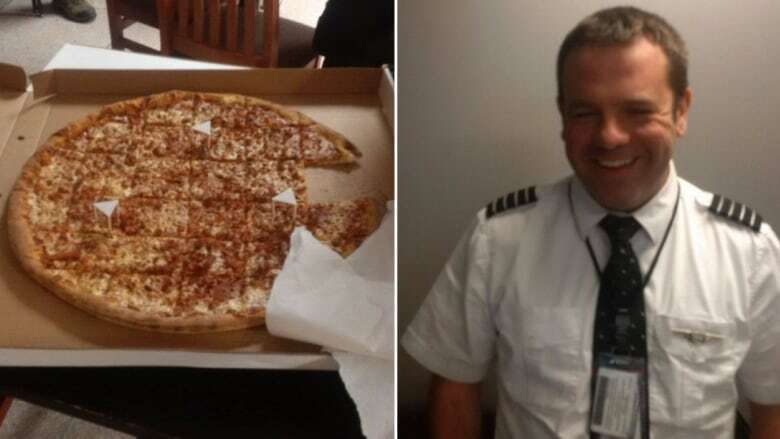 A WestJet pilot is earning high praise after paying for pizza for passengers that got rerouted while travelling to St. John's — on an Air Canada flight. "There was outwards applause when it happened," said John Samms, who lives in St. John's. The Air Canada plane that had originated in Toronto couldn't land in St. John's on Feb. 8 due to bad weather and ended up landing in Fredericton. Samms said passengers were told by an Air Canada employee at the airport at midnight that it wasn't possible to get food delivered. "Out of nowhere, a WestJet pilot emerged and said, 'Hey ... I am from WestJet and we do things differently. Who wants pizza?'" Samms told CBC's St. John's Morning Show. "Within 20 minutes to half an hour the pizza had arrived and I think he paid for it out of his own pocket." While Samms isn't sure how many people had a slice, he said at least four extra large pizzas were delivered to the terminal. Samms said it was especially surprising, since all of the passengers were travelling on a competing airline. "That was the irritating part for me ... I had taken it as perhaps a lack of effort on Air Canada staff," said Samms, who had lived in Fredericton for a few years and knew there were at least a few pizza places open. For its part, Air Canada is apologizing to customers, and acknowledging the efforts of the WestJet employee. "Unfortunately the food service was closed but thankfully, a caring customer, an airline employee himself, so truly empathetic to the situation, stepped up," Air Canada said in a statement provided to CBC News. "Clearly we should have done better for our customers." Samms said no airline is perfect all the time, but people remember when staff go out of their way. "A little bit of effort can go a long way when it comes to customer service," he said. CBC News asked WestJet for comment and the mystery pilot's name, but had not heard from that airline as of Monday.